Quantal analysis of both spontaneous and evoked release in the peripheral and the central nervous system has been in focus of my interest for many years. These interests branched recently into two different but complementary directions. First, our examination of the quantal release focuses on what determines the amplitude and the time course of the basic unit of release ­ unitary quantal event. However, the generation of unitary quantal events is a complex kinetic problem of: a) a diffusion from a vesicle through the fusion pore into a restricted space, and b) a reaction between the individual transmitter molecules and receptors located on the postsynaptic membrane. How different factors contribute to shaping the unitary events is still poorly understood. To put the interpretation of experimental findings evaluated on a solid ground we developed Monte Carlo simulation technique to simulate such processes. These simulations provided not only important insights about the physiological mechanisms involved but also those of general methodological interest. We are thus now able to evaluate the validity of a variety of techniques used experimentally. Second we are now studying the vesicular release not only in synapses but also in neuroendocrine cells that do not have a built-in sensor of released substances, a development now possible due to the introduction of electrochemical techniques of amperometric recording. Walker, A., Glavinovic, M.I. & Trifaro, J.-M. (1996). Time course of release of content of single vesicles in bovine chromaffin cells. Pflugers Arch. 431, 729-735. Walker, A., Glavinovic, M.I. & Trifaro, J.-M. (1996) Temperature dependence of release of vesicular content in bovine chromaffin cells. Pflugers Arch. 432, 885-892. Trifaro, J.-M., Glavinovic, M.I. & Rose, S.D. (1997) Secretory vesicle pools and kinetics of single vesicle exocytosis in neurosecretory cells. Neurochem. Res. 22, 831-841. Glavinovic, M.I., Vitale, M.L. & Trifaro, J.-M. (1998) Comparison of vesicular volume and quantal size in bovine chromaffin cells. Neuroscience 85, 957-968. Glavinovic, M.I. & Trifaro, J.M. (2002) Change of quantal size and parameters of release with stimulation in bovine chromaffin cells. Pflugers Arch 443, 584-594. Ghamari-Langroudi, M. & Glavinovic, M.I. (1998) Changes of spontaneous excitatory postsynaptic currents in rat hippocampal pyramidal cells induced by aniracetam. Pflugers Arch. 435, 185-192. Atassi, B. & Glavinovic, M.I. (1999) Effect of cyclothiazide on spontaneous excitatory postsynaptic currents in rat hippocampal pyramidal cells. Pflugers Arch 437, 471-478. Glavinovic, M.I. (1990) Effect of acetylcholine on single Ca2(+)-activated K+ channels in bovine chromaffin cells. Neuroscience. 39, 815-22. Ca(2+)-activated K+ channels in bovine chromaffin cells. Neuroscience. 49, 945-50. Glavinovic, M.I., Joshi, A. & Trifaro, J.M. (1992) Mastoparan blockade of currents through Ca(2+)-activated K+ channels in bovine chromaffin cells. Neuroscience. 50, 675-84. Glavinovic, M.I. (1979) Voltage clamping of unparalysed cut rat diaphragm for study of transmitter release. J Physiol. 290, 467-80. Glavinovic, M.I. (1979) Change of statistical parameters of transmitter release during various kinetic tests in unparalysed voltage-clamped rat diaphragm. J Physiol. 290, 481-97. Glavinovic, M.I. (1979) Presynaptic action of curare. J Physiol. 290, 499-506. Glavinovic, M.I. (1986) Variability of quantal events in control solution and after cholinesterase blockade in frog. Neuroscience. 17, 519-26. Glavinovic, M.I. (1987) Synaptic depression in frog neuromuscula junction. J Neurophysiol. 58, 230-46. 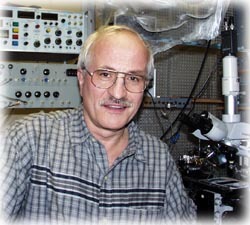 Nakajima, Y., Glavinovic, M.I. & Miledi, R. (1987) In vitro formation of neuromuscular junctions between adult Rana muscle fibres and embryonic Xenopus neurons. Proc R Soc Lond B Biol Sci. 230, 425-41. Glavinovic, M.I. (1987) Differences in presynaptic action of 4-aminopyridine and tetraethylammonium at frog neuromuscular junction. Can J Physiol Pharmacol. 65, 747-52. Glavinovic, M.I. & Narahashi, T. (1988) Depression, recovery and facilitation of neuromuscular transmission during prolonged titanic stimulation. Neuroscience. 25, 271-81. Glavinovic, M.I. (1988) Changes in the synaptic cleft potassium concentration produced by polarizing currents. Neuroscience. 24, 687-94. Glavinovic, M.I. (1988) Changes in miniature end-plate currents due to high potassium and calcium at the frog neuromuscular junction. Synapse. 2, 636-43.
synaptic output. Neuroscience. 25, 283-289. Glavinovic, M.I . (1988) Postsynaptic potentiation and desensitization in frog neuromuscular junction. Can. J. Physiol. Pharmacol. 66, 624-629. Glavinovic, M.I. & Rabie, H.R. (1998) Monte Carlo simulation of spontaneous miniature excitatory postsynaptic currents in rat hippocampal synapse in presence and in absence of desensitization. Pflugers Arch. 435, 193-202. Glavinovic, M.I. (1999) Monte Carlo simulation of vesicular release, spatiotemporal distribution of glutamate in synaptic cleft and generation of postsynaptic currents. Pflugers Arch 437, 462-470. Glavinovic, M.I. & Rabie, H.R. (2001) Monte Carlo evaluation of quantal analysis in the light of Ca2+ dynamics and the geometry of secretion. Pflugers Arch 443, 132-145. Glavinovic, M.I. (2002) Mechanisms shaping fast excitatory postsynaptic currents in the central nervous system. Neural Comput. 14, 1-19. Rabie, H.R., Rong, J. & Glavinovic, M.I. (2006) Monte Carlo simulation of release of vesicular content in neuroendocrine cells. Biol Cybern. 94, 483-499. De Luca, G. & Glavinovic, M.I. (2007) Glutamate, water and ion transport through a charged nanosize pore. Biochim Biophys Acta – Biomemb. 1768, 264-279. M. Tajparast & M.I. Glavinović (2009) Extrusion of transmitter, water and ions generates forces to close fusion pore. Biochim Biophys Acta – Biomemb. 1788, 993–1008. M. Tajparast & M.I. Glavinović (2009) Forces and stresses acting on fusion pore membrane during secretion. Biochim Biophys Acta – Biomemb. 1788, 1009–1023. M. Tajparast & M.I. Glavinović (2012) Elastic, electrostatic and electrokinetic forces influencing membrane curvature. Biochim Biophys Acta – Biomemb. 1818, 411–424. M. Tajparast & M.I. Glavinović (2012) Strain, stress and energy in lipid bilayer induced by electrostatic/electrokinetic forces. Biochim Biophys Acta – Biomemb. 1818, 829–838. Cory, S. & Glavinovic, M.I. (2006) Molecular dynamics simulations of glutamate diffusion in synaptic cleft. Crit Rev Neurobiol. 18, 61-69. Cory, S., Liu, Y. & Glavinovic, M.I. (2007) Interfacial interactions of glutamate, water and ions with carbon nanopore evaluated by molecular dynamics simulations. Biochim Biophys Acta – Biomemb. 1768, 2319-2341. Aristizabal, F. & Glavinovic, M.I. (2003) Wavelet analysis of nonstationary fluctuations of Monte Carlo-simulated excitatory postsynaptic currents. Biophys J. 85, 2170-2185. Aristizabal, F. & Glavinovic M.I. (2004) Simulation and parameter estimation of dynamics of synaptic depression. Biol Cybern. 90, 3-18. Kebir, S., Aristizabal, F., Maysinger, D. & Glavinovic, M.I. (2005) Rapid change of quantal size in PC-12 cells detected by neural networks. J Neurosci Meth. 142, 231-242. Germain, D., Maysinger, D. & Glavinovic, M.I. (2006) Vesicular roundness and compound release in PC-12 cells. J Neurosci Meth. 153, 27-42. Glavinovic, M.I., Gooria, P., Aristizabal, F. & Taghirad, H. (2007) Parametric spectral analysis of nonstationary fluctuations of excitatory synaptic currents. Biol Cybern. DOI 10.1007/s00422-007-0200-2.